Results from the 2018 National Citizen Survey have now been published and are available for viewing on the City of Fayetteville website at www.fayetteville-ga.gov/ ncs. The City of Fayetteville in cooperation with the National Research Center launched the National Citizen Survey in the fall of 2018 by mailing 1,600 surveys to homes across the city. An online version of the survey was opened to everyone in December. The survey compares Fayetteville to communities across the nation based on public opinion. The survey focused on Community Characteristics, Governance, and Community Participation within the following eight facets: Safety, Mobility, Natural Environment, Built Environment, Economy, Recreation & Wellness, Education & Enrichment, and Community Engagement. Several downloadable survey reports prepared by the National Research Center are available on the City’s NCS page. The City also produced a one-page infographic (see Page 2) that gives stakeholders a quick summary of those survey report findings. 3-5 p.m. - Easterpalooza >>> The annual Easter Egg hunt returns to the Old Fayette County Courthouse lawn. Sunday, April 21 6:45 a.m. - Easter Sunrise Service >>> Fayetteville First United Methodist Church and Main Street Fayetteville host this annual event on the Old Fayette County Courthouse Lawn. 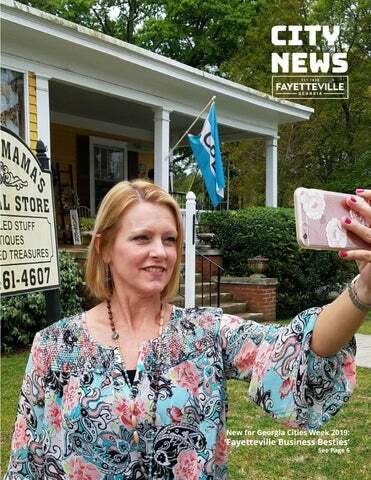 Monday, April 22 Fayetteville Business Besties >>> Take a selfie on this day in front of your favorite Fayetteville business, post it to Facebook, and tag the City. (See Page 5) Tuesday, April 23 Public Safety Day >>> A day full of special public safety announcements online and on the radio (92.5 FM), plus giveaways and more information in the City Hall lobby. Wednesday, April 24 Shred / Recycle Day >>> Bring your old electronics (no TVs) and up to 10 boxes of paper to shred to the City Hall parking lot, 9-noon. Thursday, April 25 Customer Appreciation Day >>> Visit City Hall for hourly drawings, spin the prize wheel and more! The Fayetteville City Council has created the firstever Downtown Planning Committee, and the first roster of committee members has been appointed. This committee is composed of Fayetteville business leaders and residents, including three elected City Council members. They are tasked with helping to plan the continued redevelopment of Fayetteville’s downtown district. Serving on the inaugural committee are City Council members Kathaleen Brewer, Rich Hoffman, and Scott Stacy, Shonte Walton from the Main Street Tourism Assocaition, Sam Burch from the Fayetteville Downtown Development Authority, and community members Megan Trocquet, Pearline Greene, Wendy Brunet, Butch Anthony, James Key, Jennifer Parlier, Kansas Bayly, Lauren Panter, Marilyn Taylor, and Winford Hendrix. Saturday, April 27 Church Street Park Festival >>> This free, kid-focused event happens on Church Street 3-6 p.m. Friday, May 10 Scotty McCreery in Concert >>> Zac Brown’s Southern Ground Amphitheater gates open at 6 p.m. (See back cover) Saturday, May 11 Suds on the Square >>> This fifth-annual event returns to the Old Fayette County Courthouse Lawn, noon-5. Tickets available at SudsOnTheSquare.com. Monday, May 27 Memorial Day Service >>> This annual event starts at 11 a.m. at the Fayetteville City Cemetery on Stonewall Avenue. Fayette County High Schoolâ&#x20AC;&#x2122;s Future Business Leaders of America club members joined Mayor Ed Johnson on a recent Saturday to pick up litter along North Jeff Davis Drive. The 2019 Public Safety Games took a strange turn April 15 with All Sports Golf at McCurry Park. See more photos on the Cityâ&#x20AC;&#x2122;s Facebook page @fayettevillega.gov. A literary tour group from Australia visited the Holliday Dorsey Fife Museum recently en route from Savannah to Louisiana. Citizens Police Academy participants enjoyed self defense night one recent Wednesday. day, and three participants will be chosen at random to win an official, limited-edition Fayetteville, Georgia coffee mug packed with yummy treats. It’s all part of Georgia Cities Week here in Fayetteville. So whether its a restaurant you relish, a go-to grocery or even an irreplaceable insurance agency, be sure to brag on your besties and share those selfies with us on Monday, April 22! Georgia Cities Week returns to Fayetteville on Saturday, April 20, with nine public events planned over eight days. The fun starts early that Saturday with the annual Run the Ridge 5K race on the west side of the city at The Ridge Nature Area, and then the fun moves downtown for Easterpalooza on the lawn of the Old Fayette County Courthouse. Georgia Cities Week concludes on Saturday afternoon, April 27, with the third-annual Church Street Park Festival. Throughout the week, participants will enjoy special events planned and run by City of Fayetteville employees to highlight and encourage community engagement. Georgia Cities Week is an invention of the Georgia Municipal Association, and its purpose is to highlight the ways municipalities improve quality of life for residents and for the wider community. radio (92.5 FM), plus giveaways and more information in the City Street Park April Festival HallChurch lobby.Wednesday, 24 – Shred & Recycle Day, 9 a.m. to noon at Fayetteville City Hall. Bring up to 10 boxes of paper to shred, and bring your old electronics to recycle, but do not bring televisions, as they will not be accepted. 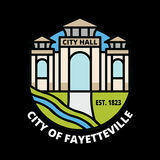 Thursday, April 25 – Customer Appreciation Day at Fayetteville City Hall with giveaways and prizes throughout the day. Friday, April 26 – Friday Night LIVE, 6-10 p.m., at the Old Fayette County Courthouse in Downtown Fayetteville. Saturday, April 27 - Church Street Park Festival, 3-6. This third annual free event is sponsored by Main Street Fayetteville and MOMS club of Fayetteville. Visit fayetteville-ga.gov/ calendar for more information, or call Deputy City Clerk Valerie Glass at 770-719-4144. 1. Pinewood Forest Residential - 55 homes occupied, and 39 under permit in various stages of completion. 2. Del Taco - Extensive grading is under way, and building is expected to begin soon. 3. Mowellâ&#x20AC;&#x2122;s Funeral Home Crematorium - Building is complete, awaiting state inspections. 4. Satterfield Development - Grading work has begun, and development plans are being reviewed by staff. 5. Marksman Properties - Three buildings are under construction, and more developments are under review. 6. Georgia Military College - Construction on the expansion building is under way. 7. Holiday Inn - Construction is underway on this location beside Piedmont Fayette Hospital. 8. Hearthside Lafayette - Building construction is complete, with final inspections expected soon.